Following the immense success of the CR-10, Creality has once again outdone themselves with the new Ender-3. Taking notes from its big brother, this budget friendly machine is nearly identical in many regards, with small yet effective design changes to meet a lower price point. Despite the vast number of similarities, one of the most notable differences with the Ender 3 is the assembly process. In contrast to the CR-10 which takes less than 30 minutes to setup, the Ender-3 for the most part is just a box of parts, requiring a greater time investment to complete the build. The official assembly video has a run-time of just under 1 1/2 minutes and suggests a rapid build time, but the reality is closer to several hours at least. Nonetheless, the Ender-3 assembly process is straight forward and painless for the most part. The brief instructional video is concise and to the point, showing exactly what goes where without any further explanation. Owners can also reference the printed 12 step sheet (included in the package) for additional information as well, but neither offers an in-depth look at the build process. We will first start by looking at what is included in the package, followed by the necessary steps for assembly and what to watch out for along the way. If you have questions or need assistance, I recommend the Ender-3 Facebook Support Group. The Ender-3 is a complete 3D Printer kit from Creality3D, packed with everything you will need to complete the build. This includes the 3D printer components, basic tools for assembly and printing… and even spare hardware should you drop a screw into the abyss. The styrofoam suffered some minor damage during transit, however none of the components appeared to be affected. Everything has been packed neatly into a single tray, with the smaller bits placed into labeled bags for organization. Here is a full look at the contents of the box and what is included with the Ender-3 kit. As the Ender-3 is a 3D Printer kit and not a pre-built machine, the assembly process has been broken down into several different stages. The entire process should take between 2-4 hours depending upon your level of experience. To provide simple navigation, you can use the links below to jump to a specific section. Since the base of the Ender-3 comes pre-assembled, we will only need to attach the vertical beams at this stage. These consist of (2) 20×40 aluminum extrusion, secured to the frame using two screws on each side (inserted from the bottom). For easier access, I would advise turning the base on to the side. Right Side: We will start with the right side of the frame first, where you need (1) 20×40 beam with the vertical pre-drilled holes. The hole that is closer to the end (approximately 80mm distance) goes on the bottom, meaning this is the side that will screw into the base. Using (2) M5x45 screws, insert these through the bottom and into the beam, making sure these are tight and the beam is locked into place. Left Side: The second 20×40 beam should have pre-drilled holes positioned side by side on one end of the beam. This end should be screwed into the base of the frame, just as we did with the right side before. Use the image above for reference, ensuring that the holes in the vertical beams are correct on both sides. Facing the machine from the front, we have two electrical components which need to be installed on the right side, the LCD screen and the Power Supply. The LCD Screen comes with a bracket which mounts on the front right, while the power supply unit mounts to the right vertical beam from behind. LCD Screen: The LCD screen is attached to the base of the frame using (2) M5x8 screws. Align the diagonal holes on the screen bracket with the matching holes in the extrusion behind it, then insert and tighten the screws as pictured in the first image. Power Supply: The Power Supply is attached to the right vertical beam using (2) M4x20 screws. Align the holes in the power supply with the holes in the extrusion, then insert and tighten the screws as pictured in the second image. On the left side of the frame, we must install two more components, the Z-Limit Switch and the Z Motor. The Z-Limit Switch will mount to the side of the left vertical beam, while the Z Motor is attached using a bracket on the back of the vertical frame. Z-Limit Switch: The Z-Limit Switch is the L shaped bracket with two screws and T-nuts, packaged in one of the plastic zip-lock bags. This bracket will be installed upside down, with the switch facing the top of the frame. Adjust the T-nuts as needed so that they can move freely, turn them to face vertical and insert the bracket into the side channel as shown. The actual location will be adjusted at a later time, where the exact position is not important at this stage. Z Motor: The Z Motor attaches to the rear side of the left vertical beam using (2) M4x18 screws. The motor comes with a bracket installed, where this will be used to mount the assembly to the frame. Insert and tighten the screws to secure the motor in place. Go ahead and insert the lead screw into the Z motor coupler now, leaving the set screws loose for the time being. Make sure to use the rubber sheath when handling it. The lead screw has been lubricated and the protective cover will prevent your hands from removing the grease. The X-Axis is the thin 20×20 extrusion that runs horizontal across the frame. Mounted to the vertical beams on either side, it can move up, down, left and right during the printing process. The X-axis has a mounting assembly on either side while the extruder carriage sits in the middle, where the motion is controlled via belt. Note: There are (2) beams in the kit with the same dimensions, but the pre-drilled holes have a different layout. The X-Axis beam that we will be using has 6 holes (3 per side). The left mount contains two motors, the X-axis motor and the Extruder motor, but can also be identified by the Facebook QR code. This assembly is attached to the X-axis beam using (2) M4x16 screws, inserted from the inside of the metal plate (shown in figure 2). Align this with the smaller holes at the end of the beam, then hand tighten the screws to secure the unit in place. Once the mount has been fastened to the beam, insert the hex wrench through the holes in the second metal plate and tighten the screws down. Note: The X-axis beam’s inner most hole is larger than the rest, drilled out to make space for the large bolt head on the motor assembly. This allows for the unit to sit flush against the beam. Due to the limited visibility at this stage, positioning the bolt head first can help with alignment of the other two holes. From the open end of the X-axis beam, slide the gantry into place by positioning the wheels at the top and bottom. The wheels should now be able to roll back and fourth in a smooth motion. In the event that all 3 wheels do not sit flush against the beam, turn the eccentric nut behind the bottom wheel until it clamps in place. Note: The side with the fan should face the front of the machine, same as the QR code on the left side of the beam (as shown in figure 2). To finalize the X-axis assembly, we just need to install the mounting bracket and belt tensioner on the right side of the beam. The mounting bracket is attached to the rear of the X-axis beam, using (2) M4x16 screws to hold it in place. Align the bracket with the matching holes, then insert the screws and tighten it into place (as shown in figure 1). On the opposite side of the extrusion, we will now install the belt tensioner using the pre-threaded bolts and T-nuts. Rotate the T-nuts to fit inside of the channel and position the bracket at the end of the beam. This will be adjusted after the belt is installed, where the position is not important at this stage. With the X axis completely assembled, all that remains now is to install the GT2 belt. Although this may have been easier to do at an earlier stage, the official instructions defer this until the final steps. Unfortunately they failed to explain exactly how to actually install the belt, so I will share the method that worked best for me. With the teeth facing into the beam, insert the GT2 belt inside of the channel and lay it over the edge. As demonstrated in picture 2 above, roll the extruder carriage over the belt with minimal force, allowing it to slide under the wheel and feed into the empty space below. Do this once again for the second wheel, where the belt should now be positioned beneath the carriage. On each end of the X axis, there is a pulley that the belt must wrap around. These act as guides to keep the belt in place and allow for smooth motion during use. With the teeth of the belt facing inward towards the pulleys, wrap this around both ends and feed it back towards the extruder carriage, passing along the underside of the beam. As shown picture 2, there is a notch on either side of the lower wheel, designed to lock the ends of the belt into place. Insert the brass ends of the belt just below these notches, where this should create moderate tension. To finalize the process, go ahead and loosen the bolts on the X-axis belt tensioner that we installed before. Pull this outwards as much as possible, removing unwanted slack and creating tension on the GT2 belt. Proceed to tighten the bolts back down to secure the tensioner in the new position and make sure it is taught. With the front of the X-axis facing forwards, position the entire unit above the vertical beams on either side of the machine. Lower the X-axis down on to the frame, allowing the outer wheels to slide into the side channels of the extrusion. You may need to press the Z beams slightly inwards in order for the X-axis to fit. Thread the lead screw up into the gold bracket behind the bowden motor (shown in figure 1), loosening the bracket if extra wiggle room is needed. Rotate the Z coupler by hand, lowering the X-axis towards the bottom and then tighten the set screws, locking the lead screw into place. Note: Raise and lower the X-axis using the Z coupler to ensure smooth movement. If it locks up, it may be necessary to make adjustments so that the lead screw is not restricted. Using the remaining 20×20 beam, thread (4) M5x25 screws into the available holes. Keep in mind that one side has larger openings for the washers to fit into. Make sure to insert the screws through here to ensure proper fitment, where they will not sit flush otherwise. Place this beam across the top of the frame and align the screws with the holes in the vertical beams. Tighten these down to complete the machine assembly (as shown in figure 2). Power Cable: Uses (2) XT-60 connectors to connect the main board and electronics to the power supply unit. Securely plug these ends into each other, making sure that the red and black wires match on both sides. Z-Axis Motor Cable: Powers the Z-axis motor which raises and lowers the gantry. X-Axis Motor Cable: Powers the X-axis motor which moves the gantry left and right. Extruder Motor Cable: Powers the extruder motor which feeds filament into the extruder’s hotend. Z-Axis Limit Switch: Triggers when the Z-Axis has reached this switch. Stops the printer from trying to move outside of the defined bounding box. X-Axis Limit Switch: Triggers when the X-Axis has reached this switch. Stops the printer from trying to move outside of the defined bounding box. The Ender-3 is now assembled and just about ready to use. Before we power on the machine though, there are still several quick adjustments that we need to make first. In the earlier stages, we left certain items with default settings or temporary positions for later calibration. The Ender-3 comes equipped with a 24V switching power supply, meaning it can run on 110 volts or 220 volts. It is important to make sure that you have this configured correctly, where the wrong setting will bring your 3D printer to a screeching halt. Before we power on the machine, make absolutely sure to double check this is set. The switch is quite visible with a yellow sticker indicating which side to use for each voltage. It has a notch to insert a tool and change the setting, where a small flat head screwdriver or equivalent will work well in this case. Note: If you are unsure which to use, 110 volts is standard in the United States, where 220 volts is the European standard. The Z-Limit Switch (upside down L bracket on the left side of the frame) is what tells the Ender-3 to stop lowering the X-axis towards the bed. We installed this during the frame assembly but used an estimated position that would later be changed. Start by rotating the (4) thumb wheels under the bed counter-clockwise, where this will contract the springs and lower the build plate. Don’t over tighten these but keep turning them until the springs are fully compressed. This tension will distance the bed from the extruder, providing ample room to level it once we are finished. Now loosen the Z-Limit Switch on the left side of the frame and slide the bracket up or down, where the switch should be several millimeters above the bed itself. We don’t want the extruder to smash into the build plate when homing, so positioning it higher at the start is preferred. Now turn on the Ender-3 using the power switch underneath the power supply. From the LCD Screen, push the knob once to bring up the menu, then navigate to Prepare -> Auto Home, and push the knob once again to select it. This will home your extruder, moving it to the far left and then lowering it until it triggers the Z-Limit Switch. Once the homing process is complete, look at the nozzle’s distance from the bed. Since the build plate is currently at the lowest point, we want to have a small gap (around 3-5mm of space) between the nozzle and bed. If the nozzle is considerably further away from the build plate than that, lower the Z-Limit Switch as needed and Auto Home again until this distance is minimized. This guide was key! Thanks! Glad to hear it helped! I was actually assembling another Ender-3 for someone else this morning and used my own guide while doing so. Found a few areas that can be improved but was nice to follow it again and see how I did. I just setup my Ender 3 and noticed when I home it, the bed retracts back as it should to it’s stop and the, Z moves to the front left and down. When the Z hits it’s stop it is making contact on the switch but the nozzle is stopping in front of the bed and the nozzle is sitting too low. It looks like the nozzle would hit the bed if it homed to the corner of it. I am new to it so I apologize for the simplistic questions. It sounds like your Ender-3 is homing correctly if it lowers in the front left corner of the print bed. The home position on this machine is actually outside of the build area for whatever reason, where the nozzle sits about an inch or so away from the build plate. It doesn’t cause any issues, just a bit of a strange design from the factory. As far as the nozzle sitting lower than the build plate however, that will pose issues when you start printing. This can be fixed using a combination of the Z-endstop switch (mounted on the left side of the frame) and the bed leveling knobs. I would recommend first tightening all 4 corners completely down and then run Auto Home to get the nozzle at the starting position. If this is sitting considerably higher than the build plate, lower the Z-endstop just a bit and then home again. Do this until the nozzle is somewhere around 3-4mm from the build plate, and you can then level the bed as normal. You want just enough gap that you can raise the build plate up to meet the nozzle, while still keeping the springs compressed as much as possible. It takes a bit of tweaking back and fourth, but once the Z-endstop is set right, you most likely won’t ever have to adjust it again (unless you make any major changes). So I’m having trouble. My Ender-3 doesn’t seem to understand the parameters even though I plugged in 220,220,250. It wont print the test puppy, it completely auto retracts the entire PLA supply, when I did get it to begin a print (not test puppy) it started creating huge zig zag lines eventually printing off the bed as well. I don’t know what to do. That is very strange behavior and not something I have seen reported with this machine. Just from the information you provided, I am going to assume you are using the included SD card and guess it may be corrupt. If you have another SD card available, try using this (or the USB) instead to rule that out as a culprit. It could also potentially be your slicer profile, although this is less likely. If you let me know what software you are using though (Cura, Simplify3D, etc) I can provide you with a good profile to test out. For the Z axis, I would first turn the coupler by hand to raise/lower the gantry and make sure that it isn’t binding up. It sounds like the motor is powered, but possibly unable to rotate the lead screw which has led to it overheating. If the Z axis moves up/down as normal, it may be something as simple as the plug not being fully seated. On a different 3D Printer, I had one wire loose in the motor connector and experienced similar issues. Unfortunately with the reboots, these can be caused by any number of issues, almost always related to power problems. You may need to go through and check power wires, board connectors, etc. This particular problem is not as rare as you would think, and has been caused by everything from poor solder joints to melted board connectors. I bet you have your extruder (E) and X-axis (X) motor cables swapped. I did, and mine behaved the exact same way. Hi did you solve your problem as I’m having the same issue? As Gary noted above, have you checked the motor cables to make sure they are not swapped by mistake? He mentioned he switched the E and X motors by accident and it caused this exact problem, where I would check that first. If the problem persists, let me know and I will see if I can figure out what else may be causing it! Just came across this guide. Some good tips here that are lacking in the official manual. One thing I figured out on my own is that it’s easier to see and attach the ribbon cable to the LCD screen before attaching it to the frame. OR. Leave it until doing the rest of the wiring hookups. Currently, I’m trying to figure out why the bottom frame had no wobble when I first took out of the box to start setting up, but now that it’s finished, either the front left or rear right has been “lifted” and now causes a wobble. Overall though. Good guide. Thanks. Thank you for the feedback, I always prefer real photos and descriptions as opposed to diagrams. Figured I would share my own in hopes it could help others. I definitely agree on the LCD ribbon cable, that is something I want to mention in my next update to the article. My large hands had trouble plugging it in at the end when I assembled the first unit, not a huge ordeal but somewhat annoying. When assembling one yesterday, I had no issues with it (leaving it to the very last step) but it would still be easiest to plug it in before mounting it. Have you tried a different surface? The one I just built was doing the same on the kitchen table, but I placed it on the floor and it is solid as a rock. You may also want to loosen the Z beams and top beam and then tighten them again, making sure they aren’t pulling the frame out of shape. I’m having g trouble with my nozzle smashing into the bed. Hitting the home button is not the issue. It goes home just fine. I then adjust the plates with a sheet of paper like everyone says to do. Everything looks perfect until I print. When I start to print, it makes a horrible noise, like it’s bottomed out and the motor it’s trying to go farther down digging the nozzle into the bed. Looking at the sensor, it has gone so far down that it’s smashing the metal bar on the sensor completely flat. Basically it has gone past what the sensor says it should go. Which doesn’t make sense since when hitting the home button it functions like it should. Please help! You are referring to the Z-Limit Switch right? So just to confirm, when you home the printer from the LCD screen it works as expected, but when running a print it completely ignores the Z-Limit Switch? That is a very strange issue and will probably take some troubleshooting (with your finger on the power switch) to narrow down and resolve. Just for the sake of it, I would double check the wiring and make sure the plugs are seated securely, both on the Z limit Switch and on the main board especially. Turn the printer on and raise the Z axis up to give you some space to work, then test out both homing and printing where you trigger the switch yourself to see if it registers. If it is indeed not triggering on prints, try changing it up and use a different method such as SD card if you were using USB or vice versa, and also change up the GCODE file and see if that helps. Thanks for the guide. I used it together with a youtube video to make sure I was doing it right. You’ve helped me out a lot! Thanks for the feedback, I’m glad to hear it helped! Hi, just put one of these together. One thing I think you might mention is the cabling. I managed to completely twist up my cabling whilst assembling the printer. This meant the extruder cabling passed under the X axis beam instead of over it. This meant I had to completely disassemble the x axis in order to untwist the cables. This was an OUTSTANDING guide! Thank you! Mt table has a wobble in it, most noticeable when the bed is back and it is printing on the front part of the bed, it wobbles left and right, kind of seems like the heater power cord pulls it down in the back corner and when it prints the right front it shifts. any ideas, it came pre build the bed section. The heated build plate (or bed) should be fixed in place, no wobble or movement as that will throw off your print jobs. You will need to use the included wrench to tighten the eccentric nut(s) on the rubber v-wheels below the bed. I believe there is only one with an eccentric nut but may be 2, someone mentioned they made several minor changes recently. If you are unfamiliar with eccentric nuts, you just want to tighten it gradually so that it clamps all of the wheels to the metal extrusion and locks the bed into place. If that isn’t clear or you have any trouble finding it, just let me know and I can grab some pictures. This guide helped me to build the printer, but i couldn’t print a single thing, the filament got rejected when i tried to print something. I choose preheat PLA, i put my PLA filament into it and wait, it take the filament, wait 2-3s and take it out. I didn’t found a way to explain it. I think that the mecanism to take the cable (the one where you connect the cable into the printer) have a problem but i’m not sure. My printer came with the plastic print bed ( with the Ender logo) loose and not attached to the aluminium plate. There were 4 paper clips holding it on. The bed has what looks like a 0.9 mm fibre glass backing. Wondering how you secure the plastic to the aluminium. Are you meant to peel the plastic sheet off the backing and stick it on ? Hello there. I’ve started on assembling my Ender 3 but noticed an issue I havent noticed comment on and thought I’d check in and see if anyone else has had the same experiences. First off, the y-gantry preassembly – the rollers were adjusted way too tight from factory and so a couple of light cuts across the v’rollers were quite pronounced when moving y axis back and forth. Ive heard comment around the traps that on some the bearing may be the reason for a feeing of a flat spot but Im inclined to disagree and am thinking its worth having a closer inspection of your v-rollers. Adjusted mine so all rollers contact with just enough force that they dont slip and that does seem to minimise the issue but I can see replacements are on the shopping list. Most concerning, both sides of the base extrusion(where the rubber feey sot and one would bolt the z-supports) – the centre web sits higher than either sides. When attaching the z supports it only mates on the middle so depending on how you tighten those bolts it would be easy to over tighten one side and intern have the frame pull out of square. Im going to have to shim mine. Anyone else notice that on their 40×40 extrusion? My bed doesn’t seem to be heating up. Do you have any troubleshooting ideas to remedy this? Just to confirm, if you go to Control -> Temperature -> Bed and set a temperature, it doesn’t heat up? I just want to make sure because the Preheat options don’t set the bed temperature. Otherwise, you can check the bottom of the bed (electrical PCB board) for any damage such as nicks and cuts, the wiring coming out of the back of the bed’s straight relief bracket and the wires running to the board, making sure nothing is out of place. If you can’t easily locate the source of the problem though, I may encourage you to contact the retailer you bought it from as they should replace the bed in this case. This is some sort of safety feature that has been triggered in my opinion. I just dont know how to reset it. When I go to setting and turn my bed and nozzle temp up they default back to zero. I followed your instructions to complete the assembly (very helpful, thanks) but I’m having an issue with the Auto Home stage. When I click auto home the X-Axis head moves to the left, then the bed moves back until a switch is heard, and then it seems to keep trying to move the bed backwards even though it can’t go any further. It seems to get stuck at this stage and doesn’t progress to where the X-Axis bar lowers. The switches on each axis are called the end stops and they act as a trigger point, telling the 3D Printer it has reached the farthest travel distance. From your description, it sounds like the Y axis end stop is being triggered but not actually sending the signal to the control board. You more than likely have a loose connection, where I would recommend taking the electronics cover off and check the wiring for that end stop. The cover is held in place by 3 screws (2 in front, 1 in back center) under the bed and will just slide off once they are removed. When facing it from the front, these are located on the left side of the board and should be labeled, where I would make sure the Y end stop is seated securely, possibly even taking it out and plugged it back in. If that doesn’t solve the problem, just let me know and we can look for problems elsewhere! I just finished setting up and powering my ender 3 printer. It seems tp be working fine til I actually try to print something. I downloaded some files from my laptop to the thumb drive it came with and they all show up on the display screen but when i try to print something off nothing happens. It just sorta brings me to this little box with 2 plus signs next to them. Would itbe easier to just plug my laptop into my printer directly? Just from what you have described, I have my doubts that they are the correct file type. The 3D Printer can only recognize files with the .GCODE extension, meaning other file types such as .STL won’t work. You need to use slicer software like CURA to convert 3D models in to printable files, which can then be properly read from the SD Card and printed out. If you do decide to print directly from the PC instead, you can absolutely hook it up over USB and do it that way. Just keep in mind that you will still need to use a slicer program like CURA and leave it connected for the duration of the print job. Rather than reading each GCODE command from the SD card, the computer will write these instructions directly to the printer. Hi and thanks for the guide! Im guessing its an software issue as the endstop communicates the first time, could it be fixed by updating the firmware? One small step seems to be missing: connecting the filament feeding tube to the extrusion motor. Other guides miss this too. I had trouble securing the tube so that it doesn’t pop out, any tips on this? As another guy noted, newer units come with the plastic bed surface attached to the metal bed with binder clips. The initial clip positions on my unit was interfering with the Y motion of the bed, clips hitting the right vertical rail. Would be nice to know what is the safe position of the clips. Thanks for the feedback, glad to hear that it helped! As for connecting the bowden tube, you will want to press in the lip on the coupler when inserting it. This acts as a locking mechanism that holds the tube in place. 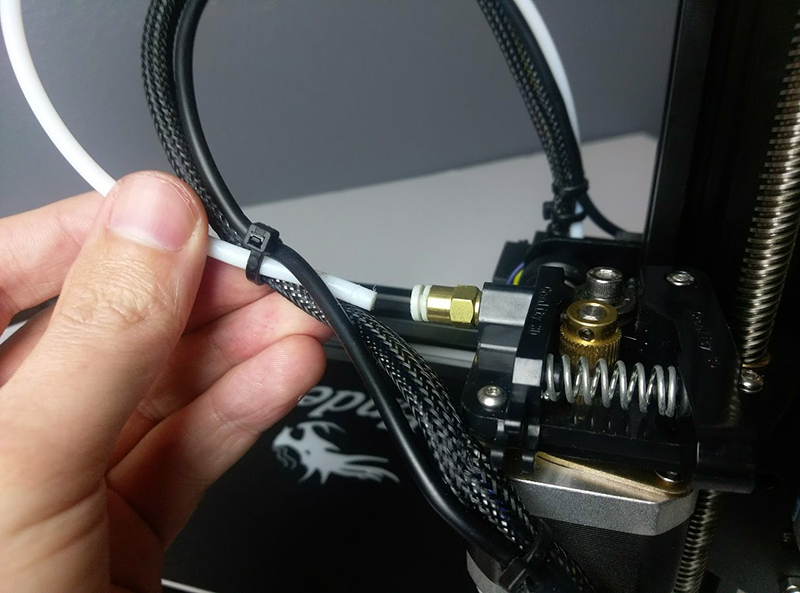 Here is a photo from my most recent guide on upgrading the Ender-3 extruder that shows what I am talking about. The coupler is the gold/white connector and you will want to press the white part in when inserting the tube. I bought one of the original units back before they started adding the removable bed surface, however the seller did send me one of these recently when I noted the original build plate was warped (and they replaced it). Personally it seems like a very cheap attempt to make a removable print surface, I opted not to use it. Just sticking the black Ender-3 BuildTak sticker directly to the bed is a much more traditional method that works great. With that said, I use binder clips on a number of my 3D Printers to clamp the glass beds in place. You will find that depending on the print you are doing, you will occasionally have to rearrange the position of these to avoid hitting the hotend, frame, etc. I would place them in the back left, back right and front right, and clip the 4th on the front left after the print has started. Depending on the size of the clips they sent, most binder clips can fold forward as well (so the metal isn’t sticking out), meaning you could place them on the sides and just fold them inwards. If the ones they sent don’t have that, you can pick those up at Staples for a couple bucks. Very helpful guide. One thing I’m running into is with slicing, I’m using Cura. This may be something simple that i’m just overlooking, but when I apply my profile settings to a file and save it to the sd, the speed and temps do not carry over into the Ender’s tunning settings. When I begin a print the settings in the tuning menu revert speed to 100 temps to 0 and fan speed to 0, so I always have to manually change those settings just before the print begins. Not sure if this is something with the firmware or the slicer. I am having issues with the T nuts on the belt tensioner, I have it all lined up, it starts to go in and then seems to be getting stuck on the side, like there was an issue in the manufacturing that there is a bump, any ideas short of just lightly sanding it down that anyone has would be greatly appreciated, Thank You. I have just finished assembling an Ender 3, and I have searched for the correct answer on where the Z limit should be. The instructions state 32mm above ground level, but, the tab on the switch prevent that. I then read that the switch should be level with the build plate, but which part of the switch?. I then read that when homed, the nozzle will outside of the build plate area, and when printing, the home position is ignored anyway. What is the correct position for the Z limit switch, and should the nozzle be above the build plate when homed?. Hope you can help. To be honest, I just eyeballed it when doing the assembly. I tightened down all 4 corners of the bed until the springs are fully compressed, and then do a rough positioning off the Z endstop slightly above that. If you want to be on the safe side, just turn the lead screw coupler by hand to lower the axis until it clicks the endstop, then check the gap between the nozzle and bed. If you need to adjust it more, raise the axis back up and move the end-stop as needed. I don’t have any technical data to cite but from my experience, having the springs mostly compressed does seem to keep the bed level for longer periods. As such, I tighten them all the way down at first, set the endstop where the nozzle sits around 3-4mm above it, and then raise the bed up to meet the nozzle. This prevents the springs from being super loose, but still gives you a bit of tweaking space to level the bed as needed. Hope that makes sense but let me know if you run in to any other questions or issues with this process! Hi Brett, I have just read the “Guide: How to Assemble the Creality Ender-3” (I should have read this before asking my question), and you have given an exact account on how to set the Z limit stop. I have watched quite a few videos on assembling and first print, but the positioning of the Z stop is overlooked. Thanking you for a concise guide, and keep up the good work. Glad to hear that you liked the article and this information has helped. I realize little things can sometimes be overlooked in such guides, but tried to make it as clear as possible. Hopefully you have your Ender-3 up and running now, but do feel free to let me know if you ever have any other questions! These instructions were very helpful, I purchased a Creality Ender 3 Pro for my son for Xmas and could not have put it together otherwise, the documentation provided with it is entirely inadequate. But I still cannot print. It took some time for me to figure out that the filament must first be threaded through the device attached to the Z-axis screw, and then fed into the actual print head where it come out. But every time I do this and then send a file to print via USB through Cura, the printer goes through a series of whirrs and movements, one of which is the little wheels that control the feed of the filament through the device attached to the Z-axis screw actually pull the filament OUT, so that when the printer begins to print there is no filament in the print head. What is going on here? First off, I am very glad to hear that these instructions helped. I purchased one of the first models back in March 2018 and definitely noticed the available instructions were quite terrible. They have made a few changes to the machine since the original launch, but thankfully it has stayed close enough that this guide still works for the latest versions. As for your issue, my first guess would be that you possibly have the wrong plug in the extruder motor, perhaps the X motor has been swapped with the E motor by mistake. If this was the case, it would keep turning the motor expecting to trigger the endstop, but since that never happens, it just keeps retracting the filament instead. Please check this first and let me know if that is the cause or not. If you can’t quite figure it out, I don’t think Cura has USB machine controls, but you can use something like Repetier Host or Pronterface. Just connect one of these to the machine, then use the buttons to move the motors left/right/up/down and make sure they are responding correctly. Thanks so much, looks like you were right! It is now feeding and applying material to the plate! Now to the next problem. After just a couple minutes, it begins scraping up what has been applied, because it seems that it thinks that it has raised itself and is working on the next level, but it hasn’t. The print head is at the same height it was when it began. That is great to hear you solved the first problem at least! As for the Z axis not raising during printing, does it move up/down correctly when not printing? You can either raise it by hand (turn the coupler on the left side) and then run auto-home, or just use the LCD screen and try raising it from there. My first guess is that the Z motor plug is perhaps loose, but if it is otherwise working as expected, that would point to some other type of issue. Hi I just got my Ender 3 and it came with a removable bed that has little clips. I’m not sure if the clips need to stay on while it is printing because if I remove them the bed slides off easily but wont they get to hot? The clips are intended to hold the removable bed in place, the heat won’t cause any problems. The removable build plate is a fairly recent addition to the Ender-3, but the clips do indeed stay on during printing. Otherwise, as you mentioned, the bed will slide around and screw up your print job.